Are you interested in carrying di Mosaico products in your studio or mosaic store? Or, are you an educator and want to use di Mosaico products in your classes? Whatever the case, contact us. We offer professional and wholesale discounts to qualified customers. We also offer, at no charge, designer kits including a complete set of sample boards and product samples. And, we can help you with determining quantities, logistical planning or overcoming installation challenges. Brailsford Public Art - Robin Brailsford and her team have extensive experience in large scale public art installations. Robin is the inventor of the LithoMosaicTM method. This method is used to cast a mosaic within a monolithic concrete pour. Visit their website at LithoMosaic.com. Julie Richey Mosaics – Julie and her team offer consulting services to artists, project decision makers and installers with one goal in mind: to promote the art of mosaic as a viable, sustainable and appropriate architectural medium. When properly executed and installed, mosaics can last for centuries. The ancient mosaic pavements of Zeugma, Turkey have endured earthquakes, invasions and environmental stresses. Yet they remain intact. Why? Because time-tested methods were used to fabricate and install them. Visit their website at JulieRicheyMosaics.com. MKMosaics/ Michael Kruzich is based in San Francisco, CA where he maintains his studio practice creating fine art mosaics, reproductions and commissions for private and commercial clients. 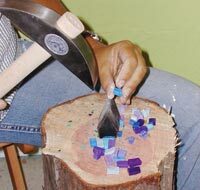 He also teaches the classical Italian principles and methods of making mosaics. A professional member of the Society of American Mosaic Member, his work has exhibited nationally and internationally, winning awards at the annual “Mosaic Arts International” exhibits in 2010, 2011 and 2015 as well as appearing in several recent art and mosaic publications. To contact us, complete the form below and press the Send Form button.